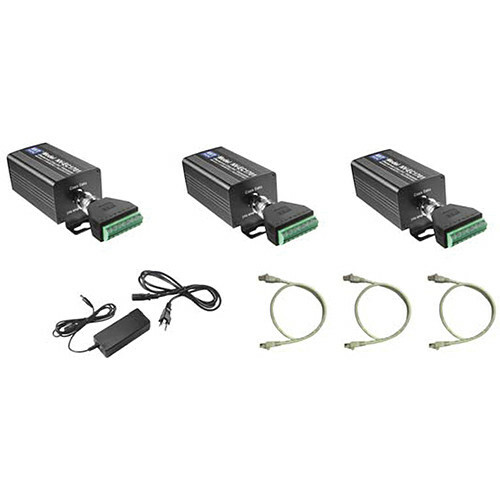 The NV-EC1701U-K2H Dual 90W Eo2 Transmission System from NVT includes three NV-EC1701U Transceivers, a NV-PS56-90W Power Supply with IEC line cord, and three NV-PC4PR Patch Cords. Each NV-EC1701U Eo2 Transceiver with PoE Power is a compact media converter that allows 10/100 BaseT Ethernet and PoE or PoE+ power to be transmitted using a 18/2 cable or similar. This device is typically used in legacy installations where an existing 18/2 cable is re-used as part of an upgrade to IP devices. Up to 48 or 56VDC Class 2 power is delivered to a transceiver, which distributes it to multiple remote transceivers and their PoE or PoE+ devices. These transceivers are simple to use, with no IP or MAC addressing required. The status LEDs indicate power and link connectivity/activity for RJ-45 and 2-wire ports. The NV-EC1701U Eo2 Transceiver transmits high bandwidth encrypted Ethernet signals over conventional 2-wire cables. The NV-EC1701U Transceiver provides transparent, end-to-end 10-BaseT or 100-BaseT connectivity with auto detection and auto-crossover. This means that IP cameras or other devices may be installed at one end, and the data is transparently delivered to the other end. Wire distances up to 1,500’ (450m) are supported, although local power (sold separately) may be required for extended distances. The transceiver supports TCP/IP, UDP, HTTP, Multi-cast, and other standard protocols. This allows for the transmission of other network traffic besides streaming video. The NV-PS56-90W Power Supply delivers power to the NV-EC1701U Transceivers. This 56VDC power supply offers output power of 90W with a 6' IEC line cord. A molded P1J 5.5mm barrel connector provides Class 2 (SELV) regulated output. Each NV-PC4PR 4-Pair RJ45 Patch Cord (0.9m) features two RJ45 plugs and is designed for use with the NV-EC1701 Transceivers. Note: Distance and number of devices supported by the transceiver may be lower due to power supply capacity and wire voltage-drop. Box Dimensions (LxWxH) 14.5 x 7.5 x 2.0"